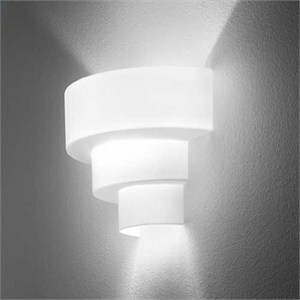 An artfully abstract wall sconce that provides up and downlight from its tiered and offset, blown-glass diffuser. Available in incandescent and fluorescent light sources, there are left and right facing versions available. Companion ceiling and pendant designs also available. A white metal backplate secures the glass diffuser to a standard 4��octagonal junction box. Open at top and bottom, the Loop sconce is available with both incandescent and fluorescent lamp options.